Research firm predicts a growth of just 3.1 percent this year compared to 10.5 percent in 2015. The smartphone market was growing very rapidly just a few years ago with a growth rate of 27.8 percent from 2013 to 2014. The following year saw a growth of about 10.5 percent from 2014 to 2015, but the current 2015 to 2016 year is expected to grow just 3.1 percent according to analysts from IDC. The firm blames the quickly saturating smartphone market and the lengthening product cycles from manufacturers. The forecasts also show that Apple iOS devices will decrease in shipments for the first time by just 2 percent. Unsurprisingly, Windows shipments are expected to plunge by about 61.6 percent from its already minuscule market share of 0.8 percent. Other operating systems outside of Android, iOS, and Windows should also experience a steep drop by about 55.7 percent YoY. Only Android is expected to rise in market share by 6.2 percent. 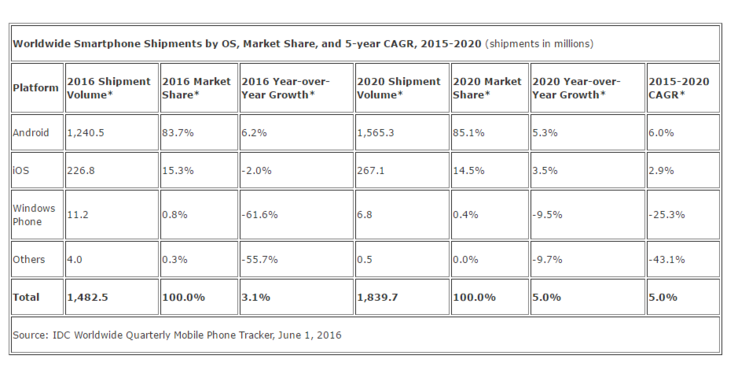 In raw numbers, IDC is predicting a total shipment of 1.48 billion smartphones worldwide for all of 2016. Established regions like the U.S., Western Europe, and China should see only small changes in shipments. Nonetheless, IDC is predicting that smartphones and phablets 5.5 inches or larger will perform about 10 percent better in these regions due to their superior multimedia features. Subsequently, the firm is suspecting that the larger iPhone 6 Plus and 6S Plus models have been selling more strongly compared to their smaller siblings.